Our Extreme 4X4 Max Series is ideal for rock and mud crawling. This series is very similar to our Heavy Hauler, except it’s built with climbing and spinning in mind. It has slightly more aggressive shifts and more punch built in. It is ready to head to the mountains or play in the bog – your choice. These units are built very similarly to our Pro Race units, but the focus is on durability while maintaining reasonable shift quality. These were specifically developed for 4×4 vehicles. The shifts on these units are designed to take the abuse and work associated with these vehicles, but without the tire chirping shifts of our race and performance units. These units feature a heavy duty, 13 vane pump with staked bushings, full-time lube modification to keep the heat down, and a modified lockup valve to improve the lockup converter’s durability so you can tow confidently in overdrive. For Fourth (OD), we use the Sonnax Dual Piston servo. This servo has 30 percent more holding force than the stock overdrive servo. That, accompanied with the 20 percent wider band, will let you tow in overdrive with confidence. Now you have nearly double the load capabilities of the stock transmission in overdrive. We use carbon composite friction plates in the forward clutch set. These clutches have an outstanding friction coefficient for maximum holding. They have superior temperature capabilities and they don’t burn easily, even in the worst conditions. This is important because the clutch has to bear the load in every gear except reverse. For the 3-4 clutch, we use 8 heavy duty friction and steel plates. More friction plates than stock; which is 6 in most cars and trucks. Some additional modifications to the 3-4 set and this clutch pack prevent scoring and burning and increase hold. This build also includes the Sonnax input drum reinforcement kit with the billet support collar and the billet piston. We next attack a weak link, the sun shell. In particularly heavy vehicles, vehicles used for heavy loads, and those used for off-roading, constant shifting occurs from first to second and reverse. To address this, we use only THE BEAST. These sun shells do not break. They are almost twice as thick as a hardened or new OEM shell and they have a reinforced collar. You will not have to worry about that sudden loss of reverse, 2nd, and 4th gears associated with the breakage of this piece. To further address the issue of heavy loads and extreme stress, we have added the GM 5-pinion planetary gears and a special proprietary modification that supports both the Low Roller and the Intermediate sprags with clutches. By having the clutches engaged when the Low Roller or Intermediate Sprag are activated, we eliminate the common issue of a “rolled sprag”. Moving on, in the planetary, both sun gears are modified to increase lube flow. This is a must in these heavy duty units. A lack of lube and cooling is a killer when pulling the boat, camper, or work trailer loaded down with equipment. The Extreme 4X4 Series uses 4 pinion planetaries. For the Extreme 4X4 transmissions we only use the thicker “K” cases that came in the very high performance cars and 4×4 trucks. You won’t have to worry about cracked bell housings and cases. Lastly, we address the valve body. Here we perform all the updates for lube and durability, and eliminate the partial lockup function, found in the 4L60E. This greatly extends the converter life and helps to keep everything much cooler. We improve the flow to the 3-4 clutch set, making sure it has enough supply to help ensure that it holds the load on this crucial shift. We enlarge the apply release feeds for the lockup clutch to make it apply positively and avoid converter clutch burn-up under heavy load. As with all our units shipping is free within the mainland USA and there is no core charge! And, since we know you need your truck, handling time is 4 days or less in most instances. Shipping can be to your residence or any business address with no additional charge. This unit comes with our PerformaBuilt warranty for 2 years regardless of the miles you drive! If it dies, you simply return it, we repair it or replace it, and return it to you within days, not weeks. 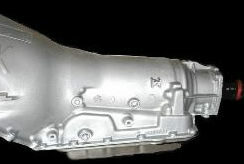 Warranty is limited to repair of the transmission at our facility. We are not responsible for any other loss incurred, such as wages, R&I cost or any other loss. 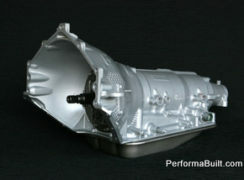 This transmission must be used with a billet torque converter. OEM torque converters are not strong enough to support this transmission. 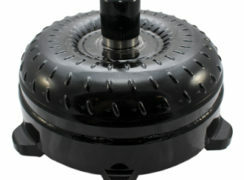 If you need help in identifying the proper billet torque converter, please contact PerformaBuilt for assistance. 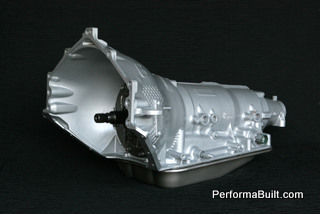 This transmission will support up to 800 RWHP.